New developments in Ukraine | Russian Legal Information Agency (RAPSI). 14:52 02/03/2015 Konstantin Kosachev, the chairman of the foreign affairs committee of Russia's upper house of parliament, the Federation Council, said on Monday that those who turn to the European Court of Human Rights (ECHR) as a result of the ongoing crisis in Ukraine may apply for help. 14:35 06/02/2015 Ukraine has formally asked Russia to to extradite its former President Viktor Yanukovich and his associates to stand trial. 11:29 06/02/2015 Ukrainian President Petro Poroshenko has signed a bill raising the maximum age for compulsory military service to 27. The law also limits the reasons for deferred service and introduces criminal liability for draft evasion. 15:08 03/02/2015 Kiev has decided to close the border to Russians with national passports on March 1, 2015, says Ukrainian government's resolution posted on the its website on Tuesday. 14:53 19/12/2014 Russian investigators suspect chief of Ukraine's Security Service Valentyn Nalyvaichenko of being the mastermind behind the abduction of two Russian journalists, RIA Novosti reported on Friday, citing Russian Investigative Committee spokesman Vladimir Markin. 16:31 24/11/2014 Board chairman of Ukrgasvydobuvannya, a subsidiary of state-owned Naftogaz of Ukraine, his deputy are suspected of abuse of authority which allegedly caused over 16.8 mln hryvnia ($1.1 mln) in losses. 10:34 14/11/2014 Ukrainian refugees who have lost their homes and family members are to file about 1,000 applications with the European Court of Human Rights, Kommersant daily reported on Friday. Seven applications have been filed so far. 10:40 31/10/2014 A law on trial in absentia, under which a trial of the alleged crimes of former resident Viktor Yanukovich can be completed, became effective on Friday. 10:26 23/10/2014 President Petro Poroshenko of Ukraine has signed a number of anti-corruption laws, including one for an anti-corruption bureau designed to root out high-ranking extortionists, says a statement posted on the president’s website on Thursday. 16:59 14/10/2014 Residents of Ukrainian territories engaged in ongoing hostilities won’t be subject to fines for falling behind the utility payments, RIA Novosti reports on Tuesday citing regional development minister Andrei Belousov. 13:35 14/10/2014 On Tuesday, the Ukrainian parliament adopted a bill that provides for creating an anti-corruption bureau. A total of 278 deputies voted for the document; the required minimum is 226, RIA Novosti reports. 16:32 03/10/2014 The authorities of the self-proclaimed Donetsk People’s Republic have declared a tax amnesty, according to the statement made by Republic’s minister of Revenue and Taxes Aleksandr Timofeev on Friday. 12:20 02/10/2014 Interpol has refused a request filed by Russian authorities to issue red notice, or international wanted person alert, for Ukrainian oligarch Ihor Kolomoisky, Alexander Drymanov of Russian Investigative Committee said addressing the issue in the upper house of parliament. 12:15 02/10/2014 Russian Investigative Committee has launched criminal proceedings against Ukrainian Defense Minister Vitaliy Heletey, Chief of the General Staff Viktor Muzhenko and a number of Army generals for genocide of the Russian-speaking population in southeastern Ukraine. 10:33 01/10/2014 The so-called lustration bill, under which about one million Ukrainian officials would be screened, contradicts the country’s constitution and international law, RIA Novosti reports, citing Ukraine’s Prosecutor General Vitaliy Yarema. 13:31 30/09/2014 Those suspected of bearing responsibility for the Odessa massacre that left at least 48 people dead have been identified, criminal cases reach courts, Ukrainian Interior Minister Arsen Avakov said on Tuesday in his interview to German magazine Focus. 11:07 30/09/2014 The Prosecutor General’s Office of Ukraine has announced on Tuesday that criminal cases were opened against officials of Russian Investigative Committee in response to Moscow’s investigation of crimes allegedly committed in Ukraine's war-torn southeastern regions. 10:36 30/09/2014 Ukraine to ask Latvia to intervene as a third party in its suit against Russia filed in the European Court of Human Rights. 14:10 25/09/2014 The so-called lustration bill, under which about one million officials would be screened, is ready to go to President Petro Poroshenko for approval. 12:53 19/09/2014 Russian authorities have opened a criminal case over the alleged use of prohibited means and methods of warfare in the self-proclaimed republics of Donetsk and Luhansk by Ukrainian forces, Igor Trunov from Trunov, Aivar and Partners law firm told RAPSI on Friday. 16:37 17/09/2014 About a million officials from different levels of government face screening and removal from their posts under the lustration bill which has been passed by the Parliament, according to Prime Minister Arseniy Yatsenyuk. 15:29 16/09/2014 President Petro Poroshenko signed a law on Ukraine’s association with the EU immediately after the Verkhovna Rada ratified the document, RIA Novosti announced on Tuesday. 12:45 16/09/2014 Ukraine has released Russian student Maria Koleda, who was detained for “destabilizing the situation” in southern Ukraine, during an exchange of prisoners with the self-defense forces, lawyer Dmitry Agranovsky told RIA Novosti on Tuesday. 16:40 10/09/2014 Amnesty International is urging Kiev to ratify the Rome Statute of the International Criminal Court so that the investigation of military crimes in Ukraine falls under international jurisdiction, Amnesty International’s Senior Director for Research Anna Neistat told RIA Novosti on Wednesday. 12:38 10/09/2014 President Petro Poroshenko has signed a law on sanctions, the Ukrainian Verkhovna Rada (parliament) announced on its website on Wednesday. 10:29 10/09/2014 Ukraine's media regulator on Wednesday came out with a list of 15 banned Russian TV channels. The list includes Channel One. Global Network, RTR Planeta, NTV Mir, Russia 24, TVCI, Rossiya 1, NTV, TNT, St. Petersburg Channel 5, Zvezda, Ren TV, RBC TV, Life News, RT and History Channel. 10:34 03/09/2014 Russian photo journalist Andrei Stenin was among those killed during an attack on a convoy of vehicles carrying Ukrainian refugees in early August. 16:37 02/09/2014 Ukraine's media regulator reported on Tuesday that a probe has been launched against a local TV company which allegedly broadcasted banned Russian television channels. 17:37 19/08/2014 Ukraine considers blocking access to Russian websites which are deemed to be propagandistic amid the ongoing conflict in eastern Ukraine. 10:52 13/08/2014 The Russian Investigative Committee could extend the list of wanted Ukrainian officials, politicians and business people to include those who sponsor the Ukrainian army in the conflict area. 17:13 12/08/2014 Russian photo journalist Andrei Stenin was arrested by the Ukrainian security services on suspicion of cooperating with terrorists, Anton Herashchenko, an adviser to Ukraine's interior minister, said Tuesday in an interview with Radio Baltkom. 11:30 12/08/2014 The Russian Investigative Committee has opened a case on the kidnapping of Russian journalist Andrei Stenin in southeastern Ukraine. 14:43 06/08/2014 The Russian Investigative Committee has obtained evidence that banned weapons have been used against civilians in Ukraine, official spokesman Vladimir Markin said. 17:51 25/07/2014 A Ukrainian court has ruled that four Russian TV channels, including RTR-Planeta, NTV Mir, Russia 24 and TV Center-International, must be banned in Ukraine, the press office of Ukraine’s National Council on Television and Radio Broadcasting announced Friday. 10:53 24/07/2014 Experts from Russia’s Investigative Committee have concluded that the Ukrainian army used white phosphorus bombs against civilian targets in eastern Ukraine, a committee official said. 15:37 23/07/2014 Kiev will introduce sanctions against Russian nationals who directly or indirectly support the separatists in eastern Ukraine, Ukrainian Prime Minister Arseniy Yatsenyuk said on Wednesday. 14:13 23/07/2014 Ukrainian president Petro Poroshenko has signed a bill on partial mobilization, his official website announced. 14:10 21/07/2014 The Ukrainian parliament meeting tomorrow will give priority to President Petro Poroshenko’s decree on partial mobilization, Verkhovna Rada Speaker Oleksandr Turchynov announced. 16:31 15/07/2014 The Kiev Administrative District Court will hear a lawsuit to ban the Communist Party of Ukraine on July 24, Justice Minister Pavlo Petrenko announced. 11:38 15/07/2014 Ukrainian Interior Minister Arsen Avakov said he had fired 585 police officers in Donetsk after reviewing their loyalty. Another 242 police officers, who are currently on an extended leave, will be reviewed later. 10:18 09/07/2014 Ukrainian President Petro Poroshenko has signed a law adding punishment for separatism financing to the country’s Criminal Code, the UNIAN news agency announced, citing the president’s press service. 15:08 07/07/2014 The Lefortovsky Court in Moscow on Monday extended the arrest of Ukrainian film director Oleg Sentsov, who was detained in Crimea, until October 11, RAPSI reports from the courtroom. 10:24 07/07/2014 The Ukrainian Interior Ministry has put Pechersky District Court Judge Rodion Kireyev, who sentenced former Prime Minister Tymoshenko to seven years in prison for abuse of power for signing gas contracts with Russia in 2009, on the wanted list, the ministry announced on its website. 14:12 04/07/2014 The Ukrainian parliament has approved a law in the first reading that would allow the government to establish a gas distribution system operator that could be 49% owned by investors from the US or the EU. 13:18 04/07/2014 A criminal case has been opened in Russia following a Ukrainian attack on the Novoshakhtinsk customs checkpoint in the Rostov Region, Investigative Committee spokesman Vladimir Markin said Friday. 14:33 02/07/2014 The number of aggrieved persons under the criminal case opened in Russia on the developments in Ukraine has reached 2,700, Investigative Committee spokesman Vladimir Markin told journalists on Wednesday. 11:16 30/06/2014 The Investigative Committee opened a case on murder and the use of prohibited weapons of war following the death of a Russian cameraman in Ukraine, committee’s spokesperson Vladimir Markin announced. 11:51 27/06/2014 Moscow’s Basmanny District Court will consider the investigators’ motion to issue an arrest warrant for Dnipropetrovsk Governor Ihor Kolomoisky on July 2. 15:23 26/06/2014 Russia’s Investigative Committee has requested a court warrant for the arrest of Dnipropetrovsk Governor Ihor Kolomoisky and plans to file for the arrest of Ukrainian Interior Minister Arsen Avakov, committee spokesman Vladimir Markin told journalists on Thursday. 15:11 24/06/2014 This Tuesday, before his flight to Vienna for an official visit, President Vladimir Putin sent a letter to Federation Council Chair Valentina Matviyenko and proposed canceling the resolution to use the armed forces in Ukraine, his press secretary Dmitry Peskov announced. 11:43 19/06/2014 Russia will request an international investigation into the death of the VGTRK journalists in Ukraine, said Konstantin Dolgov, the Russian Foreign Ministry’s Commissioner for Human Rights, Democracy and the Rule of Law. 10:28 18/06/2014 An investigation was opened into the murder of Vesti correspondent Igor Kornelyuk near Luhansk in eastern Ukraine, the Investigative Committee spokesman, Vladimir Markin, said on Tuesday. 10:28 17/06/2014 Gazprom may file another lawsuit with the Arbitration Institute of the Stockholm Chamber of Commerce to recover $18 billion from Ukraine, according to Gazprom CEO Alexei Miller. 10:31 16/06/2014 The journalists from the Russian Zvezda TV channel, who were detained in Dnipropetrovsk, have been handed over to the Security Service of Ukraine (SBU), the TV channel said on its website on Sunday. 12:17 11/06/2014 Those who are guilty of committing military crimes in eastern Ukraine will be punished even if they hide “at the bottom of the ocean,” Investigative Committee head Sergei Bastrykin said on Wednesday. 17:12 10/06/2014 Russia will not introduce any sanctions against Kiev if Ukraine signs an association agreement with the EU, Foreign Minister Sergey Lavrov said at a news conference. 17:30 05/06/2014 The Supreme Court of Ukraine has scheduled a hearing for an administrative case by Donetsk lawyer Vladimir Olentsevich on legality of the May 25 presidential election, for June 10, Olentsevich told RIA Novosti. 10:53 04/06/2014 Ousted Ukrainian president Viktor Yanukovich and his sons are contesting the freezing of their assets in European Court of Justice in Luxembourg, EuObserver reports on Wednesday. 15:30 02/06/2014 Ukrainian Naftogaz in its lawsuit against Russian monopoly Gazprom will demand a fixed price of $268,5 per 1,000 cubic metres of gas, Ukrainian Justice Minister Pavel Petryenko told RIA Novosti on Monday. 11:36 30/05/2014 The Federal Security Service (FSB) arrested four members of the Right Sector ultra-nationalist group who were plotting attacks in Simferopol, Yalta and Sevastopol, the FSB external relations center said on Friday. 13:56 26/05/2014 The Ukrainian government has instructed Naftogaz and the Energy Ministry to hire attorneys to represent them during the arbitration proceedings against Gazprom, according to a statement on the Cabinet of Ministers’ website. 10:07 26/05/2014 Chocolate king and independent candidate Petro Poroshenko has won the presidential election in Ukraine in the first round with over 55% of the vote. According to exit polls, the runner-up is former Prime Minister Yulia Tymoshenko (Batkivshchyna). 12:55 23/05/2014 The “People’s Mayor” of Slavyansk, Vyacheslav Ponomaryov, has suggested exchanging LifeNews journalists, held captive by Ukrainian law enforcement agencies, for prisoners seized by the Donetsk volunteers. 16:04 22/05/2014 Andriy Parubiy, the secretary of the National Security and Defense Council of Ukraine, announced that investigators are to determine if there are elements of crime in the actions of LifeNews journalists detained in eastern Ukraine. 11:12 22/05/2014 Part of the assets of Sergei Taruta, whom the de facto Ukrainian authorities appointed as the governor of the Donetsk Region, have been seized in Cyprus at the request of VTB Bank, Kommersant newspaper writes on Thursday. 10:28 21/05/2014 The Verkhovna Rada will ensure the unconditional implementation of a constitutional reform focused on the decentralization of power, reads the parliament’s resolution adopted on Tuesday. 10:22 20/05/2014 Ukraine’s Prosecutor General’s Office is in talks to obtain the archives of ex-Prosecutor General Viktor Pshonka with a “paramilitary group” that took part in the Maidan protests. The prosecutors believe that the archives contain information about the authorities’ struggles against the protestors, the office’s press service announced on Monday. 11:30 19/05/2014 The EU has confirmed that a visa ban would not affect the average Russian even though talks on visa-free travel had been suspended over Ukraine., according to the EU envoy to Russia Vygaudas Usackas. 12:20 16/05/2014 The next Ukrainian president will serve a five-year term, according to the Ukrainian Constitutional Court’s decision released Friday. The early election is scheduled for May 25. 16:31 15/05/2014 Kiev's Administrative Court of Appeals upheld suspension of four Russian TV channels in Ukraine, Head of the National Council of Ukraine on television and radio broadcasting Vladimir Manzhosov told journalists on Thursday. 11:12 14/05/2014 The District Administrative Court in Kiev has banned the pro-Russian Russian Bloc party, the UNIAN news agency has reported. Russian Bloc supported Viktor Yanukovich at the 2004 presidential election and the Party of Regions at the 2006 parliamentary election. 14:11 13/05/2014 The Russian Investigative Committee has opened a criminal case on attempted murder following an incident with an RT journalist in Mariupol, Ukraine. 19:00 12/05/2014 Donetsk region has claimed independence from Ukraine upon the outcome of the secession referendum which had been held Sunday, Denis Pushilin, chairman of Donetsk's temporary government, told journalists Monday. 15:01 12/05/2014 Novaya Gazeta journalist Pavel Kanygin has been detained due to ID problems at a pro-federation roadblock in Artemivsk, Donetsk Region. 16:17 08/05/2014 A Russian court has ordered the arrest of Ukrainian businessman and Kiev mayoral candidate Gennady Balashov in absentia. 14:57 08/05/2014 The People’s Council of Donetsk decided to hold a referendum on the status of the region on May 11. 14:36 07/05/2014 Ukrainian Prosecutor General's Office intends to ask parliament, the Verkhovna Rada, for permission to prosecute several lawmakers for “promoting the breakup of the country,” acting Prosecutor General Oleg Makhnitsky said at a news conference on Wednesday. 15:56 06/05/2014 The Ukrainian Parliament, the Verkhovna Rada, on Tuesday voted against holding a referendum on federalisation which was expected to be held on May 25 along with presidential elections. 12:14 06/05/2014 Russia’s State Duma has started collecting documents on the death of people in Ukraine for a lawsuit it plans to file with the Hague-based International Court of Justice. 15:41 05/05/2014 MPs Oleksandr Mirnyi and Ihor Miroshnychenko from the nationalist Svoboda party have proposed prohibiting the use of Russian symbols, in particular St. George’s ribbon, in Ukraine. 14:56 29/04/2014 The District Administrative Court of Kiev on Tuesday postponed the hearing of a lawsuit filed by Ukraine’s National Council on Television and Radio Broadcasting concerning the barring of four Russian TV channels in Ukraine until May 6. 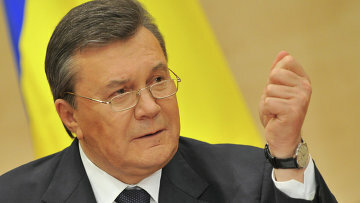 11:46 29/04/2014 Ukraine’s Acting Prosecutor General Oleh Makhnitskyi said in an interview with The Financial Times that Viktor Yanukovich and his team had allegedly removed at least $32 billion to Russia, the Prosecutor General’s Office said on its website. 10:30 29/04/2014 Polish prosecutors have opened a criminal case against unidentified persons suspected of training Ukrainian nationalists who took part in mass riots in Ukrainian capital, Przemyslaw Nowak, spokesman for the District Prosecutor’s Office in Warsaw, told RIA Novosti on Tuesday. 18:01 28/04/2014 Ukrainian government has decided file a lawsuit against Russian gas giant Gazprom, acting Ukrainian Prime Minister Arseniy Yatsenyuk told journalists Monday. 16:40 25/04/2014 Prosecutor of the International Criminal Court (ICC) Fatou Bensouda is beginning a preliminary hearing on the events in Ukraine that occurred between November 29, 2013, and February 22, 2014, the court announced in its press release Friday. 10:38 24/04/2014 The police have detained three people suspected of involvement in the abduction of Euromaidan protestors Ihor Lutsenko and Yuriy Verbytskyi and the murder of the latter in January 2014, UNUIAN news agency announced on Wednesday citing Vasyl Paskal, head of the Ukrainian Interior Ministry’s Criminal Investigations Department. 11:16 23/04/2014 The Court of Appeal has amended the pre-trial holding conditions for Dmitry Sadovnik, chief of the Berkut special police force, from house arrest to detention, on suspicion of organizing the shooting of protesters on Maidan Square last February, the UNIAN agency reported Tuesday. 10:25 23/04/2014 Ukrainian businessman Serhiy Kurchenko’s UMH media holding, which published the Ukrainian version of Forbes, has refuted media reports that it allegedly filed a lawsuit with the New York arbitration court to contest the revocation of its license by Forbes Media. 10:23 22/04/2014 Irma Krat, a journalist from Kiev who was earlier detained in the troubled Ukrainian region of Donetsk on suspicion of espionage, appeared at a media conference in Slavyansk on Monday. Commander of the self-defense forces in Slavyansk, said they suspect the woman, who was an active participant in the Maidan protests in Kiev, of spying for the ultranationalist Right Sector movement and of involvement in the torture of pro-Russian people during the Kiev riots. 15:30 18/04/2014 Ukraine’s Prosecutor General’s Office has suspected Viktor Yanukovich, former head of Security Service Aleksandr Yakimenko and former head of the Interior Ministry Vitaly Zakharchenko of founding a terrorist organization, according to a statement released by the office’s website. 12:58 18/04/2014 The Ukrainian Security Service has put Aleksandr Yanukovich, elder son of ousted president Viktor Yanukovich, on the wanted list, the country’s Interior Ministry reports on its website. 16:50 16/04/2014 The Luhansk Region Prosecutor’s Office in Ukraine has initiated legal proceedings against presidential candidate Oleh Tsarev whose public speeches were considered “actions promoting changes within the national borders,” the prosecutor’s press service reported Wednesday. 14:24 16/04/2014 Russia considers filing a complaint against the US with the World Trading Organization over the sanctions imposed on Bank Rossiya, according to the statement made by the Economic Development Minister Aleksei Ulukayev on Wednesday. 10:22 16/04/2014 Ukraine has filed its first lawsuits against Russia with international courts, including the European Court of Human Rights, according to Ukrainian Minister of Justice Pavel Petrenko. 14:52 14/04/2014 Acting president of Ukraine Aleksandr Turchinov stated that a referendum on federalization of Ukraine may be held along with the presidential elections on May 25. 16:25 11/04/2014 Russia sees no grounds to extradite ousted president Viktor Yanukovich to Kiev, and he is considered to be the legitimate head of Ukraine, Russian Prosecutor General Yuri Chaika told the press on Friday. 17:46 10/04/2014 The Ukrainian police have launched a criminal investigation in connection with an act of arson carried out against the Ukraine’s Communist party offices in Kiev, Deputy Interior Minister Sergei Yarovoi said at a press briefing on Thursday. 10:16 09/04/2014 The EU is considering sanctions for over 100 Russians, including MPs, members of the Russian Security Council, law enforcement staff and journalists, Kommersant newspaper wrote on Wednesday. 17:35 07/04/2014 Ukraine’s Verkhovna Rada on Tuesday will review a draft bill that proposes more severe penalties for separatism, acting president Aleksandr Turchinov declared in a public address on Monday. 15:18 07/04/2014 The People’s Council of Donetsk has declared its intention Monday to establish Donetsk as an autonomous republic and to hold a referendum by May 11 in order to determine whether the republic should join Russia, RIA Novosti reports on Monday. 12:09 07/04/2014 A representative of the Internet Party of Ukraine calling himself Darth Vader has appealed to the court regarding his registration as a presidential candidate, which was rejected by the Central Electoral Committee, the party announced Monday. 12:39 03/04/2014 The Ukrainian Prosecutor General’s Office on Thursday reported that 12 members of the Berkut riot police battalion have been detained on suspicion of their roles in the live-ammo shootings that occurred during the Kiev protests in February. 12:31 01/04/2014 Ukrainian Verkhovna Rada on Tuesday adopted a resolution for the immediate disarmament of all illegal militias. The resolution was approved by 256 lawmakers with 220 passing minimum required. 10:32 28/03/2014 Ukrainian law enforcement authorities discussed at an emergency meeting a proposal to ban local nationalist movement Right Sector after its members threatened to storm the parliament. 14:27 26/03/2014 Ukrainian Security Service has placed Crimea’s acting Prosecutor General Natalia Poklonskaya on a wanted list, according to a statement released by the service’s website Wednesday. 17:40 25/03/2014 The Latvian Department of Citizenship and Immigration Issues has begun the citizenship revocation process for Benes Aijo, activist in the Crimean self-defense forces, Delfi online media reports Tuesday quoting department spokesperson Zane Zeimule. 11:10 25/03/2014 Ukrainian nationalist Aleksandr Muzychko (alias Sasha Beliy), who has been placed on the international wanted list on suspicions of killing Russian servicemen, has been fatally shot, newspaper Ukrainska Pravda reports. 10:26 20/03/2014 Ukraine's National Security and Defense Council has instructed the Foreign Ministry to introduce a visa regime with Russia, Secretary of the Council Andrei Paruby said at a briefing. 13:53 19/03/2014 Russia’s Constitutional Court on Wednesday ruled unanimously that the treaty signed between Crimea and Russia is in full accordance with the Russian constitution. 15:46 18/03/2014 The 1954 decision by leader Nikita Khrushchev to hand over the Crimean peninsula to Ukraine was unconstitutional, President Vladimir Putin said in an official address to federal and regional officials Tuesday. 10:47 18/03/2014 President Vladimir Putin has approved a draft treaty between Crimea and Russia on the autonomous republic’s accession to the Russian Federation, according to a statement posted on the Kremlin’s website Tuesday. 17:51 17/03/2014 Russia may consider leaving the World Trade Organization (WTO) in light of sanctions over Russia’s handling of the Ukraine crisis, State Duma lawmaker Sergey Mironov told journalists Monday. 14:47 17/03/2014 Moscow calls on Ukrainian parliament to assemble a conference with the representatives of the country's regions, to form a new federalized constitution, according to the statement released by the Russian Foreign Ministry on Monday. 09:32 17/03/2014 93% of Crimean voters backed the region’s accession to Russia and independence from Ukraine on Sunday, according to the exit poll data processed by the Crimean republican political science institute. 13:40 14/03/2014 Ukraine’s former Deputy Interior Minister Viktor Ratushniak, and ex-commander of Interior Ministry forces Stanislac Shuliak, have been put on a wanted list, Ukraine’s Prosecutor General’s Office announced Friday. 11:58 14/03/2014 Ukraine launched an inter-state complaint against Russia with the European Court of Human Rights (ECHR), and in doing so, requested that the court apply certain interim measures, according to a statement issued by the court Thursday. 11:36 14/03/2014 Firearms, munitions and over a dozen rocket grenade launchers have been stolen from the Interior Troops’ depots in the Lviv Region, a source at the Ukrainian Interior Ministry told RIA Novosti. 10:16 12/03/2014 The US House of Representatives adopted a non-biding resolution in a 402-7 vote on Tuesday to denounce Russia’s actions in Ukraine and to urge the White House to exclude it from the G8 and to impose sanctions on Russia. 13:36 11/03/2014 On Tuesday, Viktor Yanukovich said at a press conference that he will appeal to the US Congress, Senate, and Supreme Court to review the current developments in Ukraine. 10:41 11/03/2014 Former governor of Kharkiv Region in Ukraine Mikhail Dobkin was detained in Kiev on Monday , he is accused of promoting secessionism, the Ukrainian Prosecutor General’s Office reports. 17:00 06/03/2014 In response to Russia’s stance on developing Ukrainian crisis, the US has imposed sanctions against officials and individuals who are deemed responsible for the threats to Ukraine’s sovereignty, according to the White House statement released on Thursday. 14:29 06/03/2014 Parliament of the Autonomous Republic of Crimea on Thursday has decided to join the Russian Federation, according to the document sent to RIA Novosti by Crimean lawmaker Sergei Shuvainikov. 10:51 06/03/2014 The European Union (EU) is imposing economic sanctions against Viktor Yanukovich and 17 other Ukrainian officials and businessmen. According to the document, all assets and economic resources of the people mentioned must be frozen. 12:08 05/03/2014 The Federation Council, the upper house of Russia’s parliament, is developing a bill that would provide for the confiscation of the assets and accounts of European and Amercian companies, including private ones, pending the imposition of economic sanctions against Russia. 10:45 05/03/2014 Ukrainian Prosecutor General’s Office ordered the detainment of rear-admiral Denis Berezovsky, former commander of the Ukrainian Navy, UNN agency reports on Wednesday quoting acting Prosecutor General Oleg Makhnytskiy. 15:24 04/03/2014 There is yet no need to send the Russian armed forces into Ukrainian territory, but the possibility remains open, Russian President Vladimir Putin said on Tuesday. 12:47 03/03/2014 Russian investigators have initiated a terrorism case against the leader of ultra-nationalist, far-right Ukrainian movement “Right Sector” Dmitry Yarosh, official Spokesman for the Investigative Committee Vladimir Markin told reporters Monday. 10:55 03/03/2014 The Russian police authority is ready to provide jobs to Ukrainian police officers, the Russian Interior Ministry reported Monday. Earlier, the Moscow Department of the Russian Interior Ministry reported that the Moscow police is considering forming a squadron of former Berkut officers and provide them with dormitory accommodation. 14:20 27/02/2014 Ousted Ukrainian president Viktor Yanukovich on Thursday released a statement to RIA Novosti decrying the new parliament and their decisions as illegitimate. 15:59 25/02/2014 The Ukrainian parliament on Tuesday adopted a resolution requesting that the International Criminal Court (ICC) conduct an independent investigation into the “crimes against humanity” allegedly committed in Ukraine. 12:16 25/02/2014 At a recent plenary meeting of the State Duma, A Just Russia leader Sergei Mironov proposed that the citizenship procedure for Ukrainian nationals should be simplified, taking no longer than six months. 11:56 24/02/2014 Ukrainian Security Service has no information on the current whereabouts of president Viktor Yanukovich, and does not confirm reports of his detainment in Crimea, Ukrinform agency reports on Monday. 20:35 22/02/2014 In the aftermath of deadly protests that swept the nation’s capital in recent days, the Ukrainian parliament voted to impeach President Viktor Yanukovych and called for elections to be held on May 25. 15:18 21/02/2014 Ukrainian Presdient Viktor Yanukovich on Friday declared that he is intitating the return to the 2004 constitution with redestributing power towards parliamentary republic form of government, and announced early presidential elections. 12:40 21/02/2014 Prosecutors have opened fire on police in down town Kiev, thus breaking the truce, the Ukrainian Interior Ministry's press service announced reported on Friday. 15:06 20/02/2014 The number of deaths in the ongoing clashes between the protesters and police in Kiev has officialy risen to 35, the Ukranian Health Ministry announced Thursday. 10:40 20/02/2014 The US are imposing visa sanctions against 20 Ukrainian officials who are allegedly responsible for the escalation of violence, the US State Department declared on Thursday. 16:28 19/02/2014 Ukraine's Interior Ministry has initiated nearly 40 new criminal cases following the violence that escalated in Kiev Tuesday, and reports that 58 persons have been detained. 19:29 18/02/2014 Large-scale protests resumed in Kiev on Tuesday as an increasingly aggressive crowd stormed the Ukrainian Parliament building, demanding the return of opposition control of the parliament and the presidency. 18:21 18/02/2014 Almost 40 people saught medical attention as a result of a violent clash between protesters and the police in downtown Kiev, a Kiev City Healthcare department spokesperson Natalia Vyshnevskaya told RIA Novosti on Tuesday. 11:35 17/02/2014 A law on amnesty that pardons those who participated in mass protests in Ukraine from December 27 till February will take effect on Monday. The protesters began to release occupied government buildings on Sunday, which the main condition for the amnesty. 16:26 14/02/2014 The Ukrainian National Resistanse Hedquarters reported on Friday that all protesters detained during the recent unrest have been released from custody. 14:22 13/02/2014 The Ukrainian Interior Ministry denies allegations that 60 people have gone missing since the protests in Kiev began, according to a statement released by the ministry Thursday. 12:54 12/02/2014 Unknown assailants in the Poltava region of Ukraine have shot the judge who ruled on the arrest motions for the pro-Eurozone protesters, Ukrainian Interior Ministry reports on Wednesday. 10:52 07/02/2014 A criminal case was initiated after an explosion rocked Trade Union House in Kiev, the current base of operations of the pro-Eurozone protesters, acting head of Kiev police Valery Mazan told the reporters on Thursday. 17:10 31/01/2014 Ukrainian President Viktor Yanukovich on Friday signed laws cancelling previous legislation toughening liability for participating in street protest actions and pardoning the protesters, RIA Novosti reports. 10:26 30/01/2014 The Ukrainian Parliament has adopted a bill on amnesty that will pardon those who participated in mass protests. The amnesty will not apply to the rioters who committed especially grave crimes. 15:56 28/01/2014 During a special session on Tuesday, the Ukrainian Parliament revoked a set of laws curtailing the activities of protesters, which - after having been passed earlier this month - incited riots in the country that left at least two protesters left dead. 12:59 28/01/2014 Ukrainian Prime Minister Nikolai Azarov declared his resignation on Tuesday, to facilitate a peaceful solution for the ongoing political crisis. 10:24 28/01/2014 The Ukarainian authorities reached an agreement with the opposition, that an amnesty would be declared as soon as all occupied government buildings and roads will be released, according to the statement of Justice Minister Yelena Lukash. 11:27 27/01/2014 The Ukrainian Interior Ministry has launched an investigation into the occupation by protesters of the Justice Ministry building in Kiev, according to a statement released on the ministry's website Monday. 12:38 24/01/2014 Ukraine’s former Defense Minister MP Anatoliy Hrytsenko and lawyer Stanislav Batryn have filed a lawsuit with the Kiev City District Administrative Court to have the actions of Ukraine’s Berkut riot police force declared illegal and illegitimate. 12:20 23/01/2014 A court ordered to detain eleven more activists who have taken part in the mass riots in the Ukrainian capital, Kiev prosecutor's office announced Thursday. 12:39 22/01/2014 Of the 450 State Duma lawmakers, 388 have voted to support a statement on the growing tensions in Ukraine, urging Western politicians to refrain from interfering in Ukraine’s internal affairs. 11:16 22/01/2014 Ukrainian opposition groups have found several camps of the instigators of the protest rallies near Kiev, the UNIAN agency reported on Wednesday. 18:10 20/01/2014 Ukrainian Parliamentary Human Rights Ombudsman Valeriya Lutkovskaya is looking into allegations of illegal detention in connection with the ongoing riots in central Kiev. 10:32 20/12/2013 Ukraine’s parliament on Thursday adopted a law to free all protesters detained while attending demonstrations in favor of integration with the European Union. 11:15 11/12/2013 Elite riot police squad “Berkut” and Interior Ministry forces are storming the Kiev city hall building, which was earlier occupied by the pro-Eurozone opposition protesters, RIA Novosti reports from the scene. 11:34 10/12/2013 Police moved in on protesters in Ukraine’s capital in the early hours of Tuesday, breaking up the last of their street barricades and driving the demonstrators into Kiev’s central square in an ongoing push to clear major protest sites. 14:31 05/12/2013 Police in Kiev have opened 64 criminal cases since mass riots began in the Ukrainian capital, and 14 individuals have been detained. 12:52 04/12/2013 A Kiev court has ordered the pre-trial detention for two months of nine individuals suspected of organizing riots staged near the presidential administration in Ukraine’s capital city. 11:12 02/12/2013 Police in Kiev have partially established the identities of those responsible for having organized the protests that have erupted in in the Ukrainian capital.